« Angry Birds For Symbian^3 Is Free Now! The long anticipated Nokia N9 will be hitting the shelves at Nokia stores in Malaysia on this coming Friday (7th October 2011). 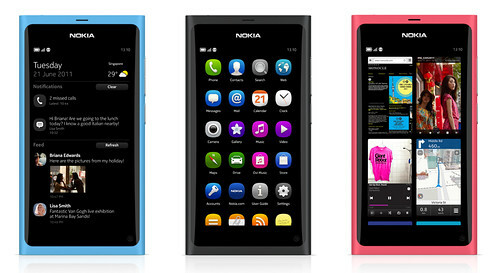 The Nokia N9 is available in three colors: black, cyan and magenta, with 2 storage options of 16GB and 64GB. The Nokia N9 16GB will be retailing at (RRP) MYR1799 (US$563 or EUR424) and 64GB at (RRP) MYR2088 (US$654 or EUR492). While you are waiting for the arrival of the latest Nokia smartphone, feel free to check out the main features of Nokia N9, 3D gaming experience on Nokia N9 and a detailed preview of Nokia N9 to know more about the device. By the way, there’s one thing not many people know about Nokia N9 is that Nokia N9 is the world’s first smartphone with Dolby Digital Plus decoding and Dolby Headphone post-processing technology, so you get a surround sound experience with any set of headphones or speakers. So head over to any Nokia Store nearby to enjoy the smooth swiping experience this Friday and you might even win yourself a brand new Nokia N9 if you are visiting selected Nokia Store in Kuala Lumpur! Visit the official Nokia N9 product page for more information. Great points there! Nokia N9 is a hit in other countries though I haven’t seen one but they for them its outstanding though I expect that already since every phone that is being launch people would say it is indeed outstanding but actually there’s more to come that we should wait and review again.